The best thing about having the blog The Climate Psychologist is all of the allies it has connected me to. Climate change is a global issue, and meeting activists (and thinktavists!) from around the world has been exhilarating and enriching. Some of the people I have connected with deeply agree with my psychological, “person-to-person, Pledge based” approach to creating a Human Climate Movement, and have gotten intimately involved with its development, really creating a team. My next few posts will feature the writing of these team members. Fred Branfman is an extremely accomplished, impressive writer and activist. (You can see his Wikipedia page here and his website “Truly Alive” Here). Among other achievements, in 1996 Fred authored the “Moral Call on Climate Change” which was signed by American religious leaders, Jimmy Carter, Eli Wiesel, and many others. 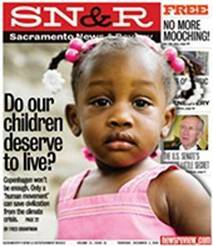 Today, I will post an article that Fred published in 2009, as the cover story of the Sacremento News and Review, “Do Our Children Deserve to Live.” Fred thinks very similar to me! As you will notice in this article, 4 years ago, Fred was calling for a “Human Movement” to fight climate change! Fred has enriched my thinking by emphasizing the inter-generational, moral, heroic elements to fighting climate change. Welcome Fred, and thank you for all you do! We have today the opportunity to live lives of meaning of which no generation before us could even dream. Our climate scientists, who alone have the authority to speak on the issue and who as rational adults we must believe, warn nearly unanimously that our present path will lead to the end of human civilization as we know it. But this also means that if we can create a movement that averts climate catastrophe we will have benefited not only billions now alive, but the many more billions who will live for the remainder of all human time. We can imagine no more heroic, meaningful or sacred mission to which to devote at least part of our lives. As individuals, we each face a question that no individual before us has had to ask: ‘Can I live with myself if I do not at least try to save human civilization from climate catastrophe? How much do I really care, not only about the 7 billion human beings now alive, but the future generations, including my own flesh and blood, who will live or die at our mercy?” Many have decided that they can only live with themselves if they at least try to save humanity – whether or not it turns out to be eventually possible. Given the fact that our current political leaders are beholden to a fossil fuel industry and corporate elite which are humanity’s enemy, a movement to save humanity will need to arise from the bottom-up, eventually incorporating tens of millions of people who love their young and humanity enough to demand a World War II-like mobilization that creates a renewable-energy economy before it is too late. The Human Climate Pledge, envisioning a one-on-one effort to enlist millions in this heroic effort, is precisely the kind of effort needed to save human civilization. We are fortunate indeed to be able to live lives of such enormous and transcendent meaning by joining this effort. Do Our Children Deserve To Live? Copenhagen won’t be enough. Only a ‘human movement’ can save civilization from the climate crisis. A strange cloud envelops human civilization as its leaders fail to take the measures to protect it that they themselves endorsed just five months ago. It is oddly fitting that the latest act in humanity’s climate-crisis drama will occur next week in the city where history’s most famous Dane, brooding in his fog-enshrouded castle, failed to act decisively upon the very question hanging over the upcoming conference in Copenhagen, Denmark. It will not be on the agenda. But whether civilization is or is not to be will be the real question haunting the shadow play about to ensue at the United Nations-sponsored talks. A child under 13 today can expect to live into the 2080s, by which time civilization as we know it will have disappeared if we continue to fail to reduce carbon emissions by 25-40 percent below 1990 levels by 2020, and 80 percent by 2050, according to our climate scientists. Although world leaders accept this recommendation, they are presently overseeing a steady increase projected to be more than double the maximum our climate scientists think safe. What will occur in Copenhagen thus continues a pattern seen since the 1997 Kyoto Protocol. Scientists I spoke with there were anguished that the treaty only sought to reduce emissions to 1990 levels by 2012. 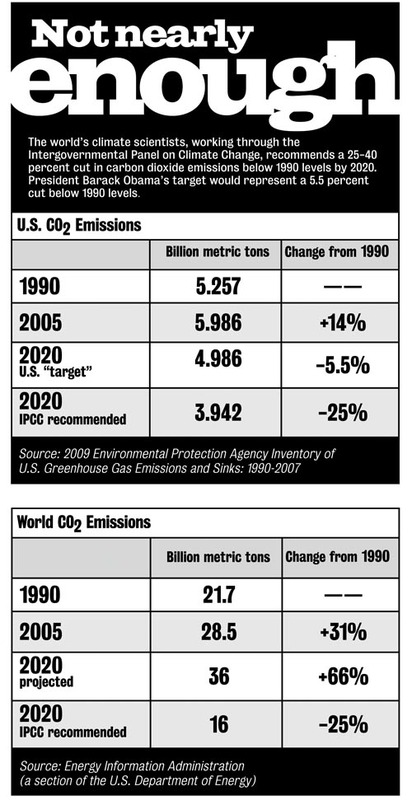 None foresaw that the treaty would be ignored and that world emissions would be 40.8 percent higher (and U.S. emissions 19.8 percent higher) in 2007 than in 1990. Copenhagen will fail because the great publics of the world have not been involved in the great human questions underlying the technical issues the scientists discuss. It is not only that the conference will fail to protect our young, but that the rest of us will barely notice. We live today as if in a trance, conducting business as usual in times so unusual that they pose an even greater threat than 20th-century wars that killed more than 100 million people. It seems incredible, for example, that nonscientists barely discuss how the human climate crisis undermines so many of their basic assumptions—in philosophy, law, psychology, sociology, economics, the arts and humanities, education and health—about human beings and their society. If a new “human movement” working beside today’s environmentalists can help more people see that we are the first adults in history to pose the single greatest threat facing our children, however, there is much reason to believe that human civilization can still be saved. When I would ask my father, a kind and gentle soul, what he saw as the meaning of his life, he would respond simply: “you boys,” referring to my three brothers and me. At the very end of his life, he asked me to interview him about his life. He wanted it to be remembered. The deep human drive to nurture our young and live on in their memories and genes has been the basis of every human society since the beginning of time, and can serve today as the foundation of a new “human movement” that can save civilization from the climate threat. People have always sacrificed daily for their children, saved for their futures and mobilized when facing existential threats to their welfare. As it becomes increasingly clear that our children today face a threat to their futures even greater than war, there is every reason to believe we will respond. This requires, however, a major discussion of the real human (not only scientific) issues involved: life and death, not cap-and-trade; whether our children deserve to live, not CO2 emissions; whether we can prioritize long-term survival and a new clean-energy economy over short-term economic growth; whether we can cooperate and share as in the 1930s to make the transition to a new and better world for ourselves and all who will follow us. though we seek to contribute to our communities we are destroying them. Our greatest challenge is to adjust ancient belief systems to the new climate realities that have undone them. If we can break through our fog and clearly see the existential threat we pose to our children, presently unthinkable actions to save them may become possible. But if not, we will remain locked in our cognitive cattle cars, moving inexorably toward the loss of everything we hold dear. • 16 billion: This is the 25 percent reduction below 1990 levels by 2020 minimally recommended by climate scientists, so as to limit temperature rise to 2 degrees Celsius and CO2 parts per million in the atmosphere to 450. Most climate scientists actually support the 350 ppm level recommended by NASA scientist James Hansen and Bill McKibben’s 350.org group, but reluctantly accept 450 ppm as the most that can be hoped for at this point. 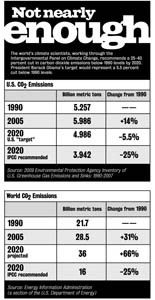 • 36 billion: The Energy Information Administration, a section of the U.S. Department of Energy, presently projects that CO2 emissions will be more than double 1990 levels by 2020. This 20 billion metric ton gap between what is minimally safe (16 bmt) and what is projected to occur (36 bmt) is a concrete measure of how much we are failing our children and future. And its human meaning is stark: The climate crisis has made children of us all. Somewhere, somehow, someplace, forces have suddenly been unleashed which we do not fully understand. Humans have never faced the possibility that they could so degrade the biosphere as to make Earth uninhabitable for them. Our inner psychology has thus far been unable to even absorb this possibility, let alone mobilize to avoid it. Like children, we live in a world we cannot control, as we helplessly face existential questions which none before have even had to ask, let alone answer. Although we know intellectually we will die, we largely live denying the painful feelings this knowledge evokes. Now, however, our individual denials of painful death feelings have for the first time coalesced into a trancelike societal denial of the death of all civilization looming over our children’s future. People have faced local “environmental” problems before. But none even imagined the possibility of actually destroying the complex biospheric conditions upon which all humanity depends for life itself. The “environment,” “planet Earth,” “Mother Nature” will continue whatever we do, though somewhat hotter. It is we, not the planet, who are at risk. We do not really face a “climate crisis,” but rather a “human climate crisis” that threatens the continuation of human civilization. Elie Wiesel began Night by describing how his neighbor Moishe the Beadle saw the Germans killing Jews, how the villagers shunned him when he warned them of the need to mobilize, and how they were eventually sent to Auschwitz. “Most people thought that we could remain in the ghetto until the end of the war. Everything would be as before. The ghetto was ruled by neither German nor Jew; it was ruled by delusion,” Wiesel explained. The lesson is clear: delusion—and denial—can kill, and have throughout history. It may be too much to expect each of us to say, “I am threatening my children unless I push our leaders to end the human climate crisis.” But ending our denial of the threat we pose to our offspring is a necessary first step to accepting the short-term sacrifice and societal shifts necessary for them to survive. Right now the ideas of “nurturing our children” and “solving the climate crisis” exist in separate compartments of our brain. We care deeply about our kids. The “climate crisis” seems far more abstract. A new “human movement” would seek to collapse the walls between the two, helping us see that nurturing our children requires doing whatever is necessary to avert our human climate crisis. The environmental movement and world’s climate scientists have done a magnificent job in bringing the world to Copenhagen. But its likely failure to produce a viable treaty speaks for itself. Only if their work is supplemented by a “human movement” can we hope for civilization to survive. [Man] is capable of the highest generosity and self-sacrifice. But he has to feel and believe that what he is doing is truly heroic, timeless, and supremely meaningful. Some years ago, I took a taxi to the airport and was surprised to note that the cab driver was in his late 70s. “Why do you drive a cab?” I asked. I will never forget the joy in his voice and look of love in his eyes: “My granddaughter!” he exclaimed. “I use the money I get cabbing to buy her things. Right now, I am saving to buy her a computer!” He spent the rest of the ride lovingly describing his granddaughter, showing me pictures of her, telling me about the various purchases he had made for her. Few people’s cognitive frameworks include concern about “the environment,” let alone its future impacts. It is indeed an “abstraction,” as Gore has said. But most people’s cognitive maps do include a deep concern for their children’s future, a concern expressed in the present, not future. Thus they begin saving after their children are born for their college education, or thus an aged grandfather works 40 hours a week to buy a computer for his 4-year-old granddaughter’s future which he will never see. A “human movement” would focus on people’s very real and tangible concerns not only for their kids’ future, but that of their nation and world. The scientific and environmental debates are critical, and must continue. But we also need a far more profound human and existential conversation that engages philosophers, poets, writers, thinkers, artists, songwriters, moviemakers, church leaders, spiritual teachers, academics, students and the great publics of the world in deciding the life or death of our species. In an ideal world, we might hope that a President Obama, who has not yet leveled with Americans about the existential issues they face, would hold a series of “fireside chats” explaining how we are threatened even more by climate change than terrorism or war, and—in the mode of a wartime leader—seek to mobilize our nation to confront it. It is likely, however, that only if those outside the system act first will our leaders respond with the tough measures we need. Gore’s reference to the civil-rights movement is apt. We have somehow managed thus far to avoid using nuclear weapons since Hiroshima without changing the consciousness that produced them. 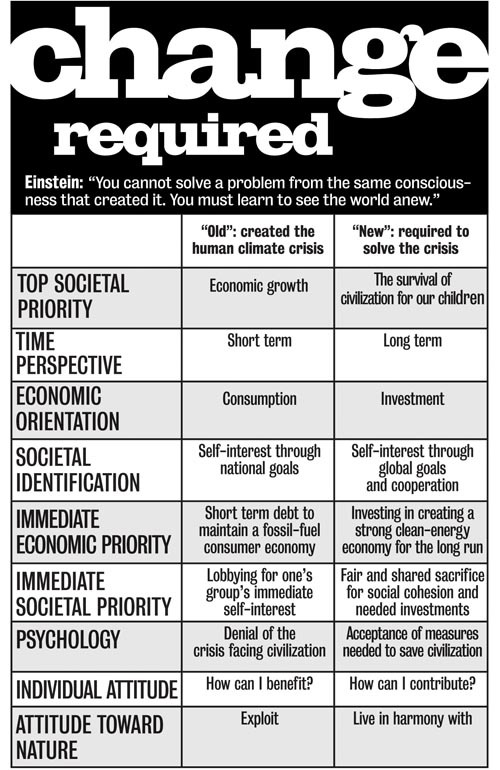 But Einstein’s insight has now become the organizing principle for solving the human climate crisis. Only if we can literally “see the world anew” will our civilization survive. Although so-called climate-change alarmists are often accused of pessimism, they are in fact hopeful, believing that once they know the truth, people will sacrifice today so their kids can live tomorrow. Those who deny the crisis, or who understand it but propose half-measures, are the pessimists. They operate within the consciousness that has produced the problem. But they are likely selling human beings short. Women and men have responded since the beginning of time to heroic missions, and the greatest irony of our time is that what we most fear today can be our greatest salvation. Moving to avert climate change is America’s only serious hope for creating a new clean-energy economy which can, after a period of short-term sacrifice, produce unprecedented wealth and dramatically extend life spans. It will also require the kind of unprecedented global cooperation of which humans have long dreamed, and that can then be extended to promote peace and reduce poverty. And, perhaps most significantly, making climate change a human issue will provide unprecedented opportunities to find meaning in life. Precisely because we are the first generation to so threaten the future, we are also the first who can take actions that will live on in the hearts of our descendants for all human time to come. Though we will neither hear their voices nor see their faces, we will find deep meaning now in knowing that all who follow us later will owe their lives to our wisdom and mercy, and celebrate us for having acted in their moment of greatest need. Some object that facing today’s grim climate realities will only increase “psychic numbing” and denial. But present approaches are not succeeding, and if telling the truth fails, we are doomed anyway. And most people usually do act to save themselves once they acknowledge the threat they face. We will only know if humanity will choose life over death when it understands that this is its choice. The successful nuclear freeze campaign of the 1980s provides important lessons for today. What motivated it and reached so many people were openly discussed life-and-death concerns. The campaign’s central document was Carl Sagan’s “nuclear winter” article in Foreign Affairs, which clearly described the horrific impacts of nuclear war. The campaign also teaches that while it is necessary to reach the general public, human issues are the key to mobilizing those who accept the science, and upon whose action our salvation will depend. It may be that if our civilization does survive, future historians will see similarities between these years and the “phony war” period in the 1930s. Then, too, isolationist nationalists prevented their society from meeting a growing threat; then, too, a divided America saw enormous numbers of citizens faced unprecedented joblessness and lowered living standards; then, too, the wealthy and powerful initially resisted the very idea that fair and shared sacrifice was necessary to save their nation. But reality rules and, as McKibben has rightly noted, “You can’t negotiate with the planet.” Sooner or later, Americans and their leaders will be forced to take the human climate crisis seriously. It may, tragically, be too late at that point. But if there is a chance to save human civilization, success then may well depend upon the groundwork we lay now—including planning for the transition to a clean-energy economy, preparing policies to meet growing human needs and, above all, helping people understand the real human stakes involved for themselves and their children. 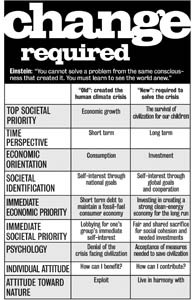 We need now a great national conversation about the human implications of climate change, conducted across at least seven dimensions: (1) Hope: Is there a strategy that can avoid the death of our civilization? (2) Philosophical: Can humans value long-term survival over short-term economic growth? (3) Psychological: Do we care enough about our children to end our denial of the risk we pose to their future? (4) Economic and social: Can we sacrifice and share in the short run so as to create a strong, new clean-energy economy in the long run? (5) Spiritual and moral: Can we tap into our deep but presently latent spiritual concern for future generations? (6) Political: Is there a new human politics that can reach more people? (7) Global: Can a new consciousness create the new global climate governance institutions we need? There is much reason to answer “yes” to each of these questions. A new “human movement” would take such issues directly to the people. Basing itself on climate science, it might, for example, sponsor university teach-ins and town halls around the general theme of “The Human Implications of the Climate Crisis,” posing such questions as “How must society change to prevent the end of civilization as we know it?” “What does it mean that we are the first generation in history to pose the single greatest threat facing our own children?” “How much are we willing to sacrifice so that civilization will not die in our children’s lifetimes?” If we would be willing to unite in times of war, how can we justify not doing so as to face a climate threat even greater than world war? A “human movement” would see teach-ins on every campus and meetings in every town that discuss the human implications of climate change, as well as the science; an artistic and intellectual outpouring, with the imagery and imagination focused on people as well as melting glaciers, preserving human civilization as well as “the environment”; giant advertising campaigns focusing on existential issues, e.g., “If you would donate a kidney so your children could live today, would you not support a clean-energy tax so they can live tomorrow?”; and grassroots education and organizing campaigns that would take such questions into living rooms across our nation. The biological mode of immortality is epitomized by family continuity. Living on through … one’s sons and daughters and their sons and daughters … has been the most fundamental and universal of all modes. While corporate and conservative propaganda has played a major role in encouraging societal denial of the human climate crisis, the psychological roots of our cloud of unknowing lie far deeper. Ernest Becker, Irvin Yalom and terror management theory social psychologists have explained how denial of death lies at the root of such societal issues as the human climate crisis. Robert Firestone and Joyce Catlett’s new book Beyond Death Anxiety: Achieving Life-Affirming Death Awareness is perhaps the fullest description to date of how unconscious death anxiety negatively affects our day-to-day child rearing, relationships, sexuality, work and feelings about ourselves. But they also discuss an alternative: a life-affirming death awareness which can not only enrich individual lives but save civilization. For though unconscious denial of death can kill, as Wiesel described, consciously facing it can spur us to action and more life. Is this not in fact what happens in everyday life? Don’t most of us, when consciously facing a life-threatening situation, react by seeking life? The key step is accepting that we face a threat. Denial, as dozens of who have never studied climate science deny the research of those who have, and as many Americans recognize the problem but recently ranked it 20th among their 20 top voting concerns. Anger, as when Rush Limbaugh viciously “jokes” that The New York Times reporter Andrew Revkin should kill himself for observing that population growth increases global warming, or when uninformed skeptics savagely attack those who accept the climate scientists’ findings. Bargaining, as when the United States sets inadequate “targets” rather than legally agreeing to cut emissions to science-recommended levels at Copenhagen; or Freakonomics author Steven Levitt discusses “geoengineering” proposals—e.g., to pump sulfur dioxide into the upper atmosphere—which most scientists consider as dangerous as climate change. Depression, perhaps our dominant response. The minor steps taken so far arise from a despairing belief that human beings cannot be roused to save themselves. Acceptance, as tens of thousands of environmentalists, young people and aware adults around the globe courageously push for actions to save us. A “human movement” would seek to vastly expand the latter’s numbers by helping people—as patiently and understandingly as possible—realize that denial, anger, bargaining and depression are unacceptable if we want our children to have the lives we wish for them. There is every reason to believe that most of us will choose life once the life-and-death stakes are brought to our consciousness. After all, we choose life every day. Humanity is today fighting against the millennia-long material development that has produced our human climate crisis. But it has as an ally an equally strong internal dynamic: the profound and powerful drive that has seen billions of people over the millennia decide, one by one, to give birth to their young, nurture and raise them, and hope to live on through them. Are we really prepared to be the first humans in history to act as if our children do not deserve to live? Are we really prepared to be the first humans to break a chain of life that stretches back into the primordial past and forward into the mysterious future, a sacred chain of life to which we owe our very existence? Are we really prepared to continue acting against our children in ways that we formerly believed only monsters in human form could behave? Asking these questions this way makes it hard to believe that we will continue to fail our children and ourselves. But in the end, we will answer such questions with our actions, not words. **This Pledge is for the United States; my hope is that other democratic countries can adapt the Pledge, and the Pledge App, and utilize a parallel, allied organizing strategy. But since the Pledge relies primarily on an electoral mechanism, and electoral processes differ from country to country–such as in whether citizens vote for individuals or for parties– it seems that the Pledge needs to be country-specific. Humanity is at a crossroads. We are in grave danger. Climate change threatens me, my family, my country, and civilization itself. Thus, fighting climate change is a moral and strategic imperative. It must be our top political and societal priority. Following the example of the American effort during World War II: we must act with common purpose, shared sacrifice, and steely resolve. The United States must mobilize all Americans, sectors of society, and international allies to fight this crisis. We can be passive, helpless victims of climate change, or we can fight back, together. Vote for candidates in local, state, and national elections who have signed the Human Climate Pledge, whenever they are running against a candidate who has not. Spread the truth of climate change to people I care about and respect, sharing the Human Climate Pledge with them. Encourage academic, religious, environmental, political, professional and community organizations in your area to endorse the Pledge. Contribute my unique skills, talents, and energy to the climate fight. This could be through local adaptation and mitigation projects, gardening or community agriculture, scientific or scholarly research, art, installing renewable energy sources, political activities, social movement strategizing, and myriad other possibilities. Most importantly: I pledge bravely face the fearsome reality of climate change. I will forsake denial, and strive to live each day in climate truth. 2) Media possibilities A couple cool things have already happened: I was interviewed fairly extensively by an NPR reporter, so hopefully that will make its way onto the airwaves soon, and Emmett Rensin quoted me in a piece on the blog PolicyMic, a blog associated with Harvard’s Institute on Politics, in which he calls for a WWII-level government mobilization to fight climate change. 3) Making connections with allies. I have received a lot of great feedback on the recent proposal, and have been in touch with a lot of great people. In fact, something I want to do is assemble a directory of allies. This would be a list of people who have expressed a desire to get involved with the Human Climate Movement, along with their special skills, areas of knowledge and expertise. My hope would be that this would facilitate cross-pollination. I am meeting so many talented, dedicated people — I would love for you all to work with each other. If you would like to be included in such a directory (or if you would like to be involved in helping me set it up! ), let me know in the comments section, or contact me directly. 4) Facilitating the Facebook Group, “Climate Change: It’s Personal.” If you have not joined yet, come check it out. It is a daily forum where people discuss their emotional, subjective responses to climate change. As a psychologist, I know that talking through personal issues can turn confusion and stagnation into clarity and energy! 5) Enjoying the holiday! Happy Thanksgiving. I am thankful for so many dedicated friends and allies; people looking to do whatever they can to fight for humanity, against climate change! In terms of Human Climate Movement Strategy, one of the critical next steps is to get the Human Climate Pledge App designed and programmed. I would appreciate input about the concept for the App itself, as well as advice on how to accomplish this task. 3) Information on which elected officials and political candidates have signed the Pledge. Perhaps videos from these candidates or information on their platforms? A. New people who take the Pledge, and their dedication, message, or suggestions, in text (or maybe also audio, or video) form. B.New elected officials who sign the pledge, and their message to the Human Climate Movement. D. People who reach landmarks in their recruitment (Like getting 10, 50 or 100 people to sign). Movement organizers will ask them to describe their experience and how they believe they have achieved their success in spreading the Pledge. E. Organizational messages and updates. 6) The ability for the Human Climate Movement central to give push notifications. **As stated above, the Human Climate Pledge/Human Climate Movement’s website will have more features, such as forums to discuss movement strategy and policy options; maps of where community projects are happening in your area; directories featuring the profiles of HCM members who choose to create them; and a platform to donate money. **Note that we not planning to include a donation tool on the App, hoping to emphasize the message that the primary way that Pledge signatories should engage is through truth spreading, pledge recruitment, and community projects. There are two choices for getting the HCP App developed: Find people to design and program the App for free, or raise money and then hire paid professionals to design and program the HCP App. Are there any talented, dedicated App developers or designers out there who want to do this for free or for a reduced fee? To raise this money, I am thinking of an Indiegogo Campaign, but I am open to other strategies if people have them! I believe it is a good idea to create a non-profit organization, so that people can make tax-free donations. So, if you wish to help with either programming, creating an Indiegogo campaign, or other forms of fundraising (Grant writing?) making the Human Climate Movement a non-profit, or overall advice, suggestions and feedback, please get in touch with me immediately! This is a Climate Psychologist milestone! While I have, until now, posted only original content, this video, by Climate Collaborative provides a fantastic reason to change it up. I agree with this statement absolutely, and I think that the person-to-person, pledge based approach can be the tool that creates that turn a committed minority into a social consensus and drastic political action. The creators of this video are beautiful, courageous examples of people living in, and spreading, climate truth. I plan on getting in touch with each of them to express my gratitude and to talk strategy.